Martin Luther King, Jr., was murdered in Memphis on April 4, 1968. Fireman George King later said that a hard, steady rain throughout the night of the assassination spared Durham the immediate violence that broke out in other cities, including Raleigh and Greensboro. The following morning, several thousand people marched peacefully from Fayetteville Street through downtown to a rally at city hall. But peace was not to last. On Saturday night, April 6, arsonists set at least 13 fires in the city. Among the targets were the College Plaza Apartments near North Carolina Central University, a grocery store on University Drive, and an entire block of the Ninth Street business district. National Guardsmen were immediately mobilized and sent to protect firefighters from rock-throwing crowds. City authorities imposed a 7 p.m.-to-6 a.m. curfew, but seven more fires were set the following night. Meanwhile, Duke University students had organized a protest that became known as the “Silent Vigil.” On April 5 about 450 students marched to the university president’s home in the Duke Forest neighborhood. They presented four demands: that president Douglas M. Knight resign from the then-segregated Hope Valley Country Club, that he sign a newspaper ad calling for a day of mourning and asking Durham citizens “to do all they can to bring about racial equality and freedom,” that he “press for the $1.60 minimum wage for Duke employees,” and that he appoint a committee to study collective bargaining and union organizing at the university. About 250 demonstrators remained at the house for two nights. 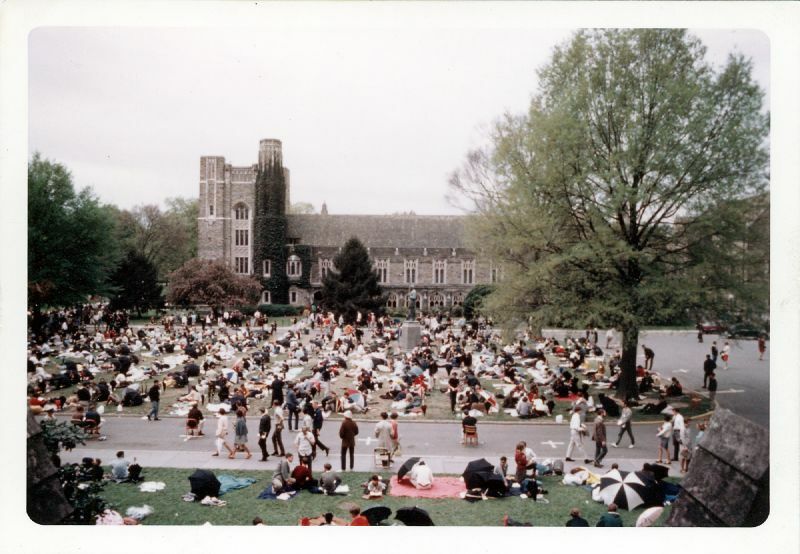 On April 7, Palm Sunday, after Knight’s physicians ordered him into seclusion, the students moved to the Duke University Chapel quad. Over the next five days, the protest grew to include about 1,500 students, faculty members, and employees, who sat in silent protest around the clock. Local 77, an employees’ union, called a sympathy strike. Ultimately, the university’s board of trustees pledged to meet the minimum wage demand and form the collective bargaining study group. Before the vigil broke up, some members of the board even joined the demonstrators to sing "We Shall Overcome." The list was presented by Professor Leonard J. Hausman of NC State University. In addtition to the list of recommendations are letters between Professor Hugh Lefler of UNC Chapel Hill and the governor discussing the list.